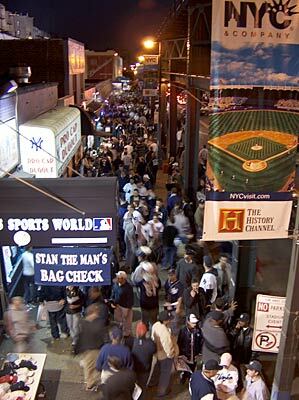 Alan and I took the express 4 up to 161 St./Yankee Stadium last night for game 2 of the ALCS. This time I sat in the center field bleachers instead of right field. I realized what it is I like about Bob Shepperd's voice (he's the public address announcer at Yankee Stadium): he sounds like he's being piped in direct from the 1930's, through a hole in the space time continuum. Before the game started, Alan and I watched some Red Sox take batting practice. At one point, Pedro Martinez came to the outfield to play long toss to stretch out his arm. Of course, the "Who's your daddy?" chants began immediately. Why he made that daddy remark I'll never know. He claimed after the game that he didn't regret what he said, but if he doesn't, Red Sox fans and his teammates will. 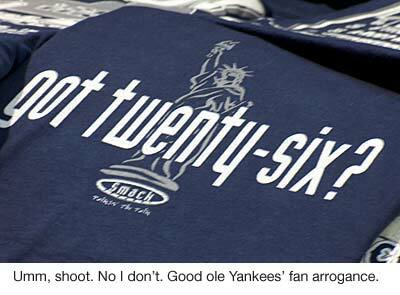 You just can't give the most obnoxious, arrogant baseball fans in the country ammunition. He'll be hearing that chant for the rest of his career at Yankees Stadium, unless, of course, he joins the Yankees this offseason. The Yankees would probably overpay for him, and he's clearly on the downhill side of his career, but still, if you're the Red Sox, do you want to see Pedro in pinstripes? It would be an echo of too many painful memories, and it would just tickle Yankees fans to death. When the game started, I realized that roll call only occurs from the right field bleachers. Inevitably, we were seated near a completely inebriated Yankees fan who was teetering all over the place. He kept falling into me, and every time he went to buy another beer with his buddy I hoped he'd pass out somewhere and not return. And of course, we had the alpha-obnoxious Yankees fan running up and down our aisle, cursing out anyone who wouldn't stand up and scream along with him. There seems to be one in every bleacher section. He was dripping with sweat, his face red, his voice nearly hoarse. He kept apologizing to a young boy of eight or nine years old everytime he dropped another f-bomb. What a f***. Most of you know how the game went by now. In the bottom of the first, Pedro walked Jeter on 4 pitches, hit A-Rod, and then gave up line drive single to Sheffield to give the Yanks a quick 1-0 lead. Alan and I were looking at the stadium radar gun, and Pedro was hitting mid-90's with his fastball. He looked to have decent velocity and stuff, certainly better than the last time I saw him here, when he got shelled, but his command was just a bit off. A few non-strike calls here and there hurt him. One thing I did like about Shea Stadium which I remembered last night was that they post not just the velocity of each pitch but what type of pitch it was. How they figure that out I have no idea, but they do. Most pitches you can identify by the velocity and the path it takes (fastball, curve, slider, changeup, and split are easy to identify). However, for one pitch at Shea the board displayed "cutting fastball." Huh? Amazing, to think that it's someone's job to sit there all game and press a button to display the pitch type. At the Yankees game, from where I was sitting, I had some difficulty identifying between some of Pedro's changeups and curves. We were just a bit too far away for me to see the pitch path clearly. A side observation: MLB needs to speed up games. I know they tried, a few years ago, but they failed. Umpires at my community softball game do a better job of keeping games going. Batters step out after every pitch to unstrap and restrap their batting gloves, tap their feet, take practice swings. C'mon. Batters shouldn't get to call time or to step out of the box after each pitch. That should be a rule. MLB also doesn't need two minutes between innings. Most pitchers ready after just a couple warm-up pitches. There should be a rule banning the fake pickoff throw to third and then to first. Pedro did that several times. Has that play ever worked? They should just make that a balk. Meanwhile, the magic pixie dust they sprinkle on players when they join the Yankees to revive retreads was working as Jon Lieber was mowing down the Red Sox, and Olerud hit a go-ahead two-run homer off Pedro in the sixth. Lieber has a nasty slider. It's especially effective against right-handers. Whenever it was 0-2 on a batter, I'd look at Alan and say "slider." If he didn't get the strikeout with it, I'd say "slider" again. The Red Sox had to know it was coming, and they still couldn't lay off of it. Teams with two million or so lying around can do worse than invest in a pitcher who's coming off of Tommy John surgery. Look at A.J. Burnett, Lieber, Kerry Wood, Ryan Dempster, John Smoltz, Matt Morris, Tom Gordon, Eric Gagne, and Mariano Rivera. It's as commonplace in baseball now as ACL reconstructions in basketball and football. Someday we're going to see a mediocre pitcher undergo pre-emptive Tommy John surgery just to see if it adds some velocity and stability. Are there a pair of weaker center-field arms than Damon and Bernie? Watching Bernie warmup before innings is painful. He has a strange hitch in his throwing motion. Damon's arm is just plain weak. They flashed a picture of Jack Nicholson up on the scoreboard at one point. Jack's a Yankees fan? He roots for the most hated basketball team in the country and now the most hated baseball team as well? The next time I watch Karate Kid I half expect to see Jack sitting ring-side, sharing laughs with the Cobra Kai Sensei and cheering on Johnny as he take out opponent's legs. Gary Sheffield scared the crap out of me everytime he was at bat against the Cubs in last year's NLDS, and he's still imposing in the box with that menacing way he waves the bat around as if to say, "This thing is like a toothpick in my hands it's so light." Baseball needs to do something about batters standing on top of the plate, though. The rules are just stacked against pitchers. It's nearly impossible to throw inside anymore. You either end up hitting the batter, whereupon he either takes first or yells at you and elicits a warning from the umpire, or you hit the inside corner but the batter jumps out of the way, making the ball appear inside, and it's called a ball. They should move the batter box away from the plate a bit, maybe two to three inches. Jeter, A-Rod, and Sheffield were right on top of the plate, and Pedro couldn't drive them off of it. 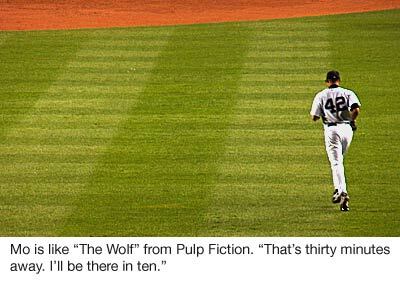 I imagine Mariano Rivera lounging around during games like Brad Pitt's Achilles in Troy, dozing on a couple of furs with a couple naked women, when the bullpen coach comes running in. Rivera looks up, somewhat groggy. "Have them lay out my uniform, shoes, and glove. In the meantime, two hot towels and my razor, please." 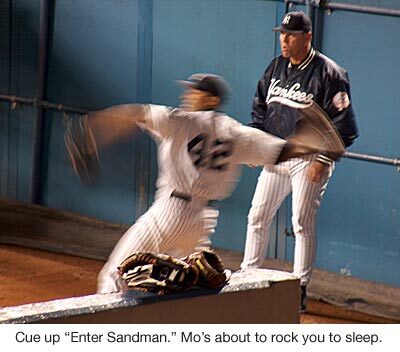 And then Mo comes trotting out to Enter Sandman, the entire stadium starts rocking, because it's easy to be an arrogant, cocky Yankees fan when Mo comes in to clean up the mess. He comes in, and like Achilles with that jumping-shoulder-stab move, wields his cut fastball like the sickle of the Grim Reaper, not just handcuffing batters but literally boring through the handles of left-handers bats, leaving the debris of exploded bats lying all over the grass in front of home plate. Now comes news that Schilling can't start Game Five. If the Yankees play the Cubs' arch nemeses the Cardinals in the World Series, I'm not sure who I could root for.